Reading and share top 12 famous quotes and sayings about Choral by famous authors and people. Browse top 12 famous quotes and sayings about Choral by most favorite authors. 1. "I sang a lot in college - I was in a choral group in college. But, then, when I moved to New York, I really just concentrated on acting." 2. 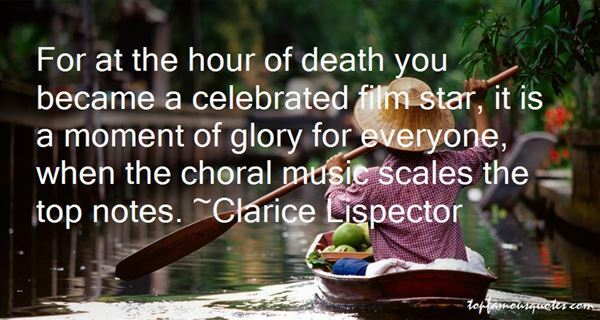 "For at the hour of death you became a celebrated film star, it is a moment of glory for everyone, when the choral music scales the top notes." 3. "I never listen to music when I am writing. It would be impossible. 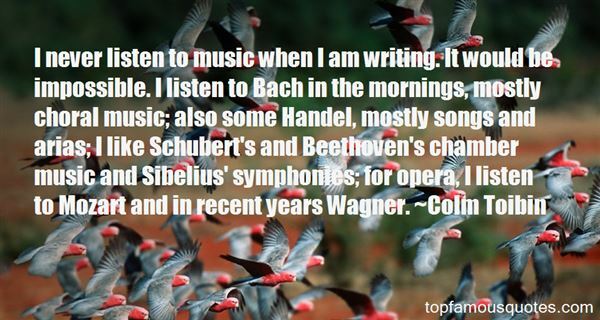 I listen to Bach in the mornings, mostly choral music; also some Handel, mostly songs and arias; I like Schubert's and Beethoven's chamber music and Sibelius' symphonies; for opera, I listen to Mozart and in recent years Wagner." 4. 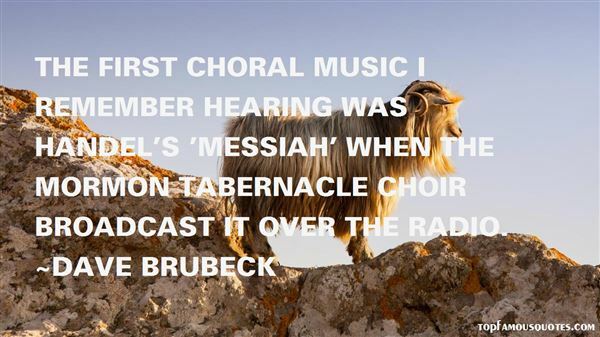 "The first choral music I remember hearing was Handel's 'Messiah' when the Mormon Tabernacle Choir broadcast it over the radio." 5. "The whispers of shared ecstasy are choral." 6. "Memories shift like loose snow in a wind, or are a chorale of ghosts all talking over one another. There is only ever a sense that what is real to me is not real to others, and to share a memory with someone is to risk sullying my belief in what has truly happened." 7. "In attempting to say who Jesus is, the best we can do is to utter words provoked by the collective attempts to do so over the centuries-- a choral work we cannot possibly translate back into a few phrases, any more than we can assume that a concert is adequately described by its listing in the program, or that a painting is interchangeable with its title. Reading the program or the museum's catalogue, we have no notion of what actually was performed or displayed. We can extend the metaphor: a literal reading of the Bible amounts to little more than what we learn from a concert program, or even the score. It is the symphonic whole that bears the meaning that nothing less can remotely capture." 8. "I have such happy memories of performing in a choir and I don't think I'd have got where I am today without all that experience. So my advice to young singers is to either join your school or church's choir or find one in your local area. Choral music at any level teaches you so much about musicianship and blending your voice." 9. "Singing harmony is not the same as singing a part in a choral group, where you know you're going to have to hit this note and then that note. There are nuances that change every day. Maybe today you have a slight cold or voice fatigue, or you've done something and there's a slight difference in your breathing." 10. "When the truth is that there would be no great Western music, and certainly no decent choral repertoire, without the Catholic faith." 11. "As the day light left the city that night, the streetlamps were not up to anything like their usual candle-power. It was difficult to make anything out clearly. Ordinary social restraints were apt to be defective or not there at all. The screaming that went on all night, ignored as background murmur during the day, now, absent the clamor of street traffic, had taken on urgency and despair – a chorale of pain just about to pass from its realm of the invisible into something that might actually have to be dealt with. Figures which late at night appeared only in levels of grey were now seen to possess color, not the fashionable shades of daytime but blood reds, morgue yellows, and poison greens." 12. "I was asked by a group to write a song on the theme of brotherhood. This was before women's liberation, when brotherhood meant men and women both, so I wrote the song. Since I had always been very fond of the Passion Chorale, I wrote words to that great piece." Abby: I could be a slave to your darkest desires. I can do things. Anything you want.Tommy: Well, that's terrific, because we have a lot of laundry piled up and the apartment is a wreck. Abby: Anything you desire, my lord. I can do laundry, clean, bring you small creatures to quench your thirst until I am worthy."